"A boat loaded with trash, pulled from the river, maneuvers to the dock located next to the Churchill Bridge collection station during the annual Friends of the River San Bernard Cleanup on Saturday, Sep 13. It was a successful event declared by chairman of the cleanup, Russell York, who reported that a group of ten boats, two jet skis, and three collection stations of volunteers filled a commercial-sized dumpster with river trash. 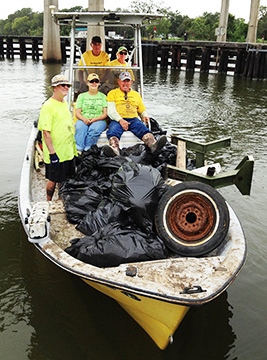 The boat, manned by Tommy and Peggy Davidson at the helm, along with Gene Sullivan and Claudia and Melvin Pechacek, collected trash downriver from the bridge to River’s End at the Intracoastal Waterway."